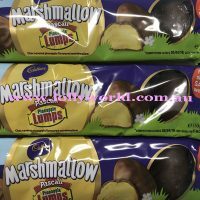 Pineapple Lump Easter Eggs are smooth milk chocolate covered pineapple flavoured marshmallow made famous by New Zealand. A classic Easter treat made with real fruit juice. Each packet contains 6 eggs. Pineapple Lump Easter Eggs are smooth milk chocolate covered pineapple flavoured marshmallow from New Zealand. A classic Easter treat made with real fruit juice. Each packet contains 6 eggs.